At the ILC, collision will be very simple while at the LHC two composite particles makes complicated events. It is often said that the ILC is a precision machine. One should note, however, that the ILC is actually a discovery machine that can find new phenomena and new particles LHC at CERN would not be able to discover. This capability is made possible by a few unique features of the ILC. First, at the ILC, two elementary particles – namely, electron and positron, are collided while at the LHC two composite particles, protons, are collided. A proton is made of two up quarks and one down quark bound together by many gluons, and when they collide, many unwanted debris are produced. When a Higgs particle is produced at the LHC, the decay products of the Higgs particle is only a small fraction of all particles one observes in the collision. On the other hand at the ILC, most of the particles, or in many cases all the particles, one see come from a Higgs particle. The cleanliness is overwhelming. The situation has been likened to the difference between a collision of two raspberry pies and that of two raspberries. This gives the ILC a capability to find small signals of new particles or new phenomena. 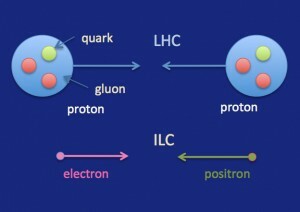 Another advantage of the ILC is the control of the colliding electron and positron. The polarization of the colliding elementary particles can be specified as well as their energies. By controlling the polarizations, specific types of interactions can be turned on and off, thereby enabling to see small new effects coming from new physics. Sometimes, interactions that overwhelm a signal of new physics could be removed by the control of polarization leading to discovery. The LHC is indeed a powerful machine with an impressive energy reach. A new run with energy upgrade has just begun and we are extremely excited about the prospect of new discoveries to come. Such a discovery may provide the ILC with a fantastic opportunity if the new particle is within the energy reach of the ILC. On the other hand, however, one should not forget that the new particle might be discovered first by the ILC. Since we are talking about new particles, it is difficult to predict what will happen. One could, however, pay attention to the Tevatron at Fermilab that can be considered as a younger brother of the LHC and shares many features of the LHC. The Tevatron has a glorious list of discoveries including that of the top quark. For the Higgs particle, however, it could not find a clear signal even though some twenty thousand Higgs particles were created. As we all know, the discovery of the Higgs particle had to wait for the LHC where about half a million Higgs particles were produced. At the ILC, only a handful of generated Higgs particles would do. It may be that a new particle are already produced at the LHC that as to wait for the ILC to be discovered. Once a new particle is detected at the ILC, its nature can be fully elucidated by the ILC. Precision certainly is a great advantage of the ILC. For the measurements of interactions of the Higgs particles and other particles, indeed, the ILC is statistically equivalent to several tens of the ultimate LHCs running simultaneously. The ILC, however, is much more than a precision machine, it is in fact a tremendous discovery machine!